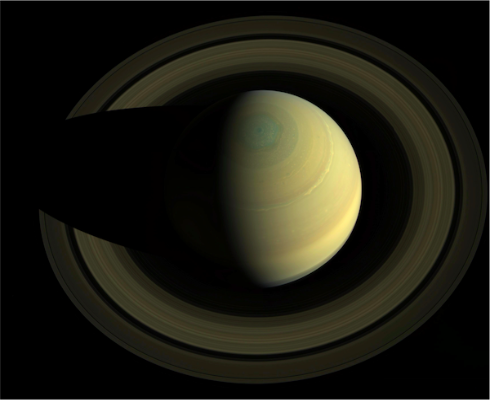 A panorama of the Saturn system 404,880 miles across. 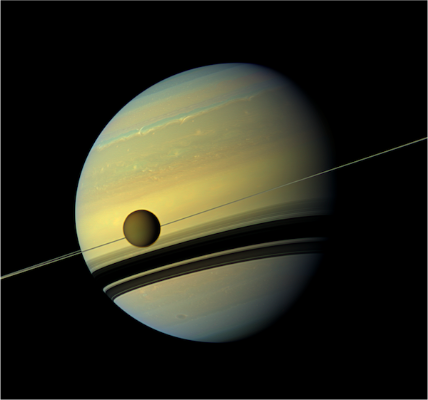 Saturn’s largest moon Titan is passing in front of Saturn. First color view of Titan’s surface, obtained on January 14, 2005. Ligeia Mare, the second largest known body of liquid on Titan. The tortured surface of Saturn’s moon Enceladus reveals geologic activity from its past that continues today. 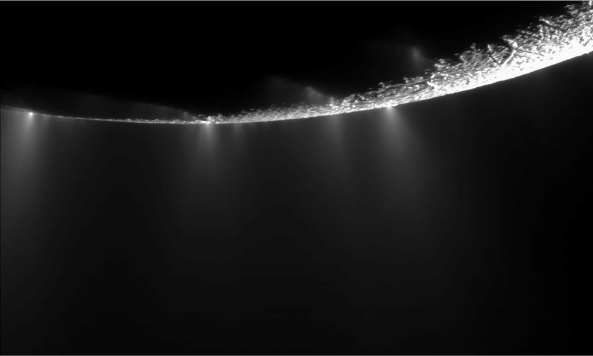 Dramatic plumes spray water ice from great fractures near the south pole of Enceladus. The peculiar bright-and-dark nature of Iapetus was a mystery for hundreds of years until Cassini’s close-up. This view of Hyperion reveals crisp details across the sponge-like surface of this Saturnian moon. A view of Saturn as human eyes would have seen the planet and its rings shortly after Cassini arrived in 2004. 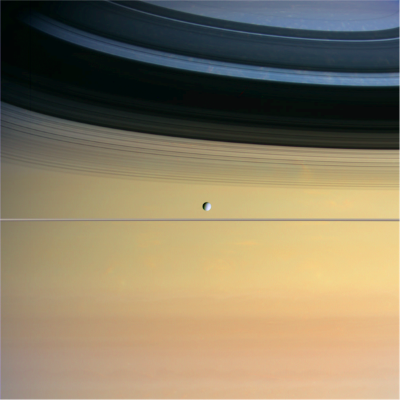 Saturn’s moon Dione floats in front of the giant planet, which sports bluish hues in its northern regions. A rare, near-polar orbit in October 2013 brought Cassini over the top of Saturn. 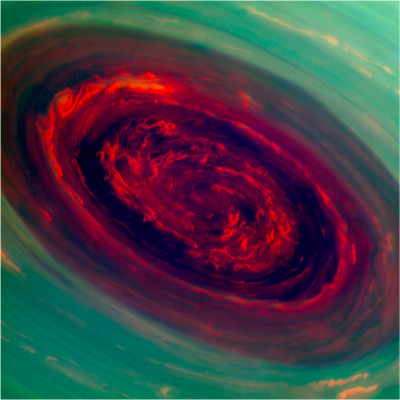 The spinning vortex of Saturn’s north polar storm resembles a deep red rose of giant proportions. A once-every-30-years storm churns through the atmosphere in Saturn’s northern hemisphere in 2011. 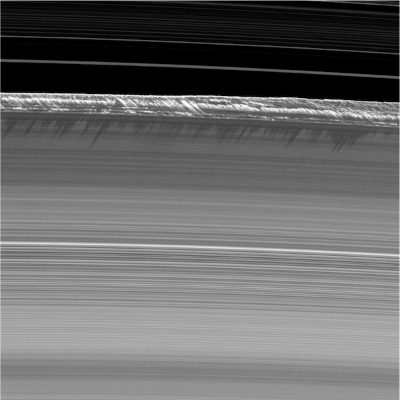 Vertical structures rise abruptly from the edge of Saturn\'s rings to cast long shadows. The gravity of Saturn’s moon Prometheus perturbs the planet’s thin F ring. Neither you nor I could survive at Saturn. It’s cold and so far away (900 million miles) that the sun looks like a bright dot. 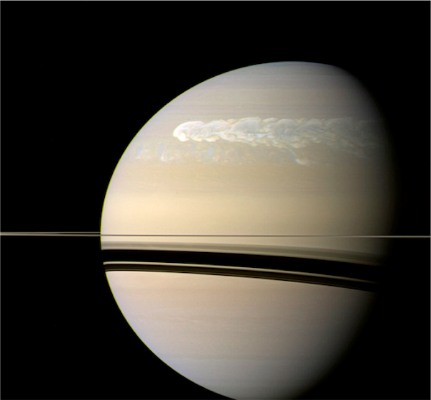 There’s none of the kind of air we can breathe on Saturn—or even a solid surface. But we don’t physically have to be at the Ringed Planet to know what it’s like. We have a robot exploring Saturn and its moons for us: NASA’s Cassini spacecraft. Cassini has been exploring the Saturn system for nearly a decade—engineers at NASA’s Jet Propulsion Laboratory in Pasadena, California, performed the nail-biting burn that put the 6-ton spacecraft into orbit around the planet on June 30, 2004. Shortly afterward, Cassini dropped a European Space Agency probe called Huygens that descended to the surface of Saturn’s largest moon. We have received hundreds of thousands of pictures from Cassini and Huygens. This gallery includes my favorite images reflecting the splendor and diversity of the Saturn system. In the early 1980s, two Voyager spacecraft flew within 63,000 miles of Saturn in flybys that lasted for just a few days. As a junior member of the science team that worked on the spacecraft, I huddled with my colleagues around the TV as the images were beamed down. I became so interested in Saturn’s rings that I went back to school at UCLA and got my doctorate. More than 30 years later, I have the privilege of leading the science team of the Cassini mission, which includes 240 geologists, physicists, and planetary scientists from across the U.S. and Europe. Cassini basically lives in the Saturn system. It has orbited the planet 206 times, getting as close as 12,763 miles to the top of Saturn’s atmosphere. Armed with visible-light and infrared cameras, a powerful radar, and a host of instruments to measure ions and magnetic fields (among other things), Cassini has showed us a host of splendors, including how Titan, Saturn’s giant moon, presents a kind of funhouse mirror view of Earth. On Titan, liquid methane plays the role that liquid water does on Earth, carving river channels and filling lakes and seas. We got our first views of Titan’s surface in 2005 when the Huygens probe parachuted through the dense, hazy atmosphere and landed safely, returning data and pictures from the surface of spidery river channels and rounded pebbles. Radar and near-infrared imaging from the orbiting Cassini spacecraft soon added other surface details, including windblown dunes, high mountains, and methane- and ethane-filled polar lakes and seas. 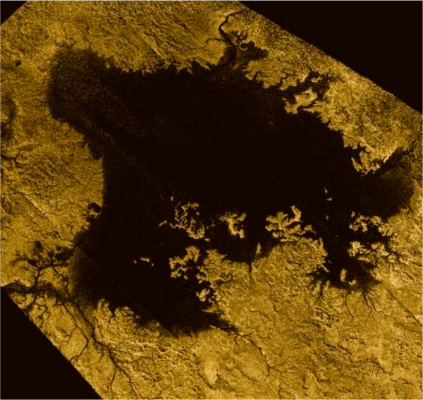 One of the most stunning images of the surface shows Ligeia Mare, Titan’s second largest sea, which is larger than Earth’s Lake Superior and as deep as Lake Michigan. By analyzing how Titan tugs on our spacecraft and changes the steady radio link we have with Earth, we have also discovered a subsurface water ocean beneath Titan’s thick, icy crust—a possible habitat for life beyond Earth. 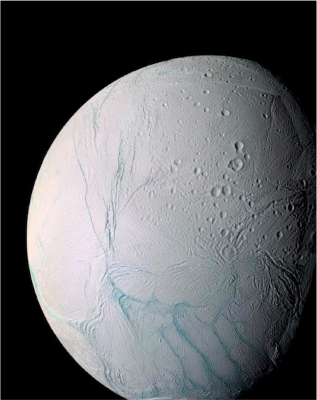 Cassini has also skimmed within 17 miles of the icy surface of Saturn’s moon, Enceladus. We were surprised to find that the tiny moon isn’t frozen solid but has jets of water ice continuously spewing from its south pole. A liquid water ocean, in contact with a rocky core, was recently detected beneath Enceladus’ south pole, pointing to yet another possible habitat for life in the Saturn system. Saturn, it turns out, is full of weird moons, and Cassini has captured them in all their glory. Iapetus is one of my favorites—it has one of the brightest and darkest sides of any moon in our solar system. One side is as dark as charcoal, the other as bright as fresh snow. Like our moon in relation to Earth, Iapetus keeps one face toward Saturn. The side that leads in its orbit is like the front of a car flying into a cloud of bugs—it gets coated with dark material we think comes from a distant moon, Phoebe. What impresses me most about Iapetus is a huge equatorial ridge that circles most of the moon, making it look like a giant walnut. 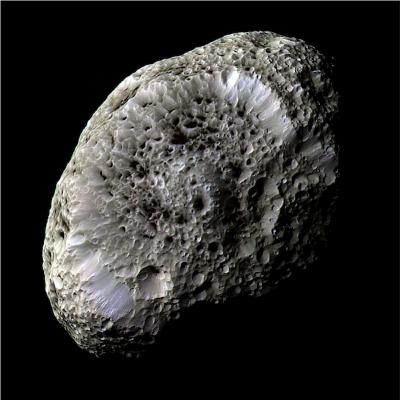 I also love Hyperion, a much smaller moon that tumbles chaotically as it orbits Saturn. It reminds me of a giant sponge. Saturn’s rings—my original area of focus—have turned out to be more complex than we first thought. Cassini helped us to discover that individual particles clump together throughout the rings and create their own gravity. As these clumps move by each other in orbit around Saturn, gravity causes the clumps to form and disperse in an intricate cosmic dance that helps us to better understand, on a grander scale, how planets form. Cassini has also shown us that our long-held perception of the rings as basically flat was incorrect. When the sun was edge-on to the rings in 2009, an event that happens once every 15 years, Cassini revealed 1.5-mile high vertical structures towering over the 30-foot-thick rings. I caught my breath when I saw these structures that are as high as the Rocky Mountains and their shadows! During the 10 years that Cassini has been in orbit—which is the equivalent of one-third of the time it takes for Saturn to orbit the sun and complete one “Saturn year”—we’ve observed remarkable changes in Saturn and seen this jewel of the solar system from practically every vantage point. From over the top of Saturn’s north pole, we have gained a bull’s-eye view of the rings, and spied the intriguingly regular weather pattern known as “the hexagon” around the north pole. 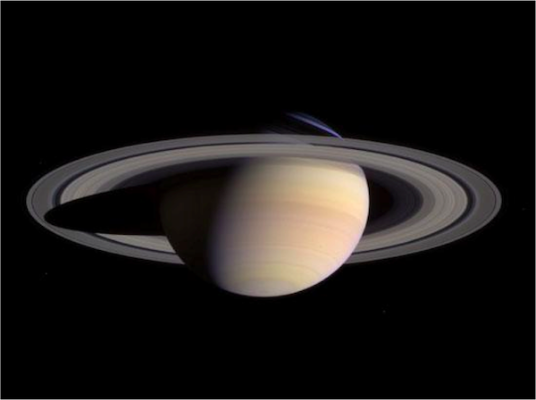 By observing several seasons on Saturn, we’ve been able to see the colors in its atmosphere flip between golden and green-blue depending on where sunlight is falling. We’ve also had an up-close look at a once-every-Saturn-year storm that tears across the planet. My favorite image is a montage of Saturn eclipsing the sun made from 141 individual images taken on July 19, 2013. It reveals nearly all of Saturn’s rings, including newly discovered ones associated with some of the planet’s tiny inner moons. The bluish, glowing E ring looks like a royal halo circling Saturn. Three other planets also appear in the picture: Venus, Mars, and Earth. We knew Earth would be captured in this set of images and asked people around the world to step outside, locate Saturn in the sky, and send us photos of themselves waving. It seemed only fair to tell Earthlings we were taking their picture! Even my husband, Tom, and I went outside in Kansas where we were visiting relatives to take part. The mission used those selfies to recreate the Saturn mosaic. Each discovery has opened up a host of new questions. We plan to work right up until the mission’s planned end on September 15, 2017, when Cassini will get so close to Saturn that the planet’s monster gravity will pull our robot into its crushing embrace. We look forward to getting as much information as possible about Saturn’s innermost rings, its atmosphere, and internal structure until Cassini sends us its last packet of data. On that final day, we will sadly say goodbye to our robotic friend who has shared so much with us about this distant, astonishing place. Linda Spilker is the project scientist of NASA’s Cassini mission and is based at NASA’s Jet Propulsion Laboratory in Pasadena, California. Images 1, 2, 5, 6, 7, 8, 9, 10, 11, 12, 13, 14, 15 courtesy of NASA/JPL-Caltech/SSI. Image 3 courtesy of NASA/JPL-Caltech/ESA/University of Arizona. Image 4 courtesy of NASA/JPL-Caltech/ASI/Cornell. NASA, Saturn, science, space, Thinking L.A.